Last week the Los Angeles Times ran a story, by Laura Nelson and Dan Weikel, about how transit ridership has declined in Southern California at the same time that large investments have been made in public transit, mostly in the rail system. 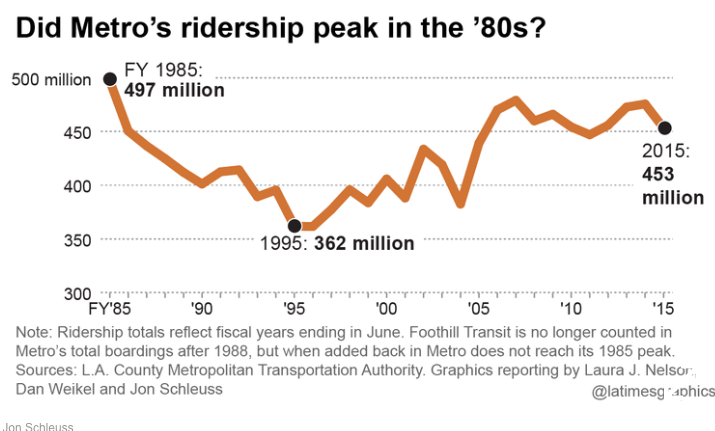 The article led with the fact that Metro’s boardings declined 10 percent between 2006 and 2015, notwithstanding billions of dollars of capital expenditures, and that Metro had also experienced long-term declines in ridership, going back to when L.A. transit ridership peaked in 1985. Then the Times ran something of a counter piece, an op-ed by Ethan Elkind, a researcher and writer on environmental law and policy. Elkind explained some of the reasons for the recent decline in ridership, argued that the long-term decline is not as bad as the article made it seem because of the starting date the authors chose to compare to (more on that below), and why the future should not be so bleak for transit in the region, once the rail lines and extensions those billions are paying for have opened. Then, today, there were four letters in the Times responding to Elkind. Transportation issues are complex, involving at the micro level decisions that individuals make balancing myriad tiny factors and at the macro level decisions that governments make balancing massive public and private interests. To me, the Times story and the response to it illustrate how people can ignore this complexity at the same time that they fail to make obvious connections. What about the 10 percent decline since 2006? Well, the article answers that question, but you have to dig. Nelson and Weikel recount the history that after a settlement with the Bus Riders Union in the 1990s Metro added more than one million hours of bus service; as a result, ridership soared, reaching 492 million boardings in 2006 (very nearly the 1985 peak). Then what happened? Well, it’s right there in the article: the Great Recession hit, ridership which had been rapidly increasing leveled off, and then between 2009 and 2011 Metro reduced bus service by 900,000 hours. Hardly a shock, but there will be a correlation between reducing service and losing riders. There are, of course, many factors that affect decisions that people make about how to travel. In the 30 years since the 1985 peak in ridership, many of the jobs that people once took transit to were moved outside of the region’s inner, transit-served core to places like Lancaster and the inland Empire (or, in the case of the garment industry, to Asia). Immigrants, who, as the article points out, use transit more frequently than non-immigrants, followed those jobs into sprawl-ville. We also have fewer immigrants now than in 1985. Given these trends, both demographic and geographic, it’s remarkable that Metro has about the same ridership today that it had 30 years ago (and don’t forget that 25% increase since 1995). Reading the letters in today’s Times about the ridership issue illustrates that no matter how complex a problem is you can always try to reduce it to something you can express in a letter to the editor. The first letter is from Santa Monica’s own Bruce Feldman, who presents himself as the classic Everyman, with “common sense,” in contrast to “scholars like Ethan N. Elkind.” To Feldman, it’s clear: Southern Californians “want real world steps that can be put into place quickly.” He says that we should dramatically lower the cost of public transportation, create more bus lanes and run buses every three to five minutes to make transportation “even more convenient than cars.” “That’s just common sense,” he says. Hey, I agree. But does Feldman believe that anyone could accomplish those things quickly? I mean, does he know, for instance, how many years it took to wrestle the new bus lanes on Wilshire away from those Southern Californians of his who drive cars? Does he known anything about the politics (and federal financing) of fares? Does he know what buses cost? Common sense is great, but does Feldman believe that he’s the first to think up this stuff? Feldman concludes his letter with classic Amur’can anti-intellectualism, saying that he’s “sure academics will have plenty of theoretical reasons why I’m wrong.” I don’t think so! I mean, I read a fair amount of academic literature in this field and I’ve never read anything saying that lowering fares, increasing frequency, and speeding up buses would not attract more riders. The problems are not theoretical; they’re practical and political. Moore’s point in today’s letter is that if you lower fares, you increase ridership more effectively than by using the money to build rail. Although everyone likes low transit fares, particularly for poor people, around the world the cities that have the best and busiest transit systems, including the best service for working-class and poor people, are not cities where fares are cheap. And by the way, they usually have lots of rail. Every few weeks during the academic year I take the Metro 534 bus from downtown Santa Monica to Culver City, where I catch the Expo train to meet my wife at USC (where she teaches). We do this so that we can get some dinner and then hear a concert at Disney Hall or the Music Center. Mind you, my wife has her car at USC and we drive back, but we never regularly went to weeknight concerts before the Expo line opened, because for me to get or USC or downtown L.A. on the freeway would be a nightmare. I get on that 534 bus around 4:30 p.m. and it’s always packed, usually standing room only, full of workers coming home from jobs in Malibu and Pacific Palisades. We get on the freeway, and it usually takes 50, 55 or even 60 minutes to get to the train in Culver, where most of us passengers disembark. When the train opens in Santa Monica in May, those passengers, our transit-riding heroes, will be able to exit the bus and get on the train here in Santa Monica, and a trip that now takes almost an hour to Culver City will take 15 minutes, saving them up to 45 minutes in each direction. And the ride will be smooth.